What could be more exciting than owning a genuine piece of our nearest cosmic neighbour...? 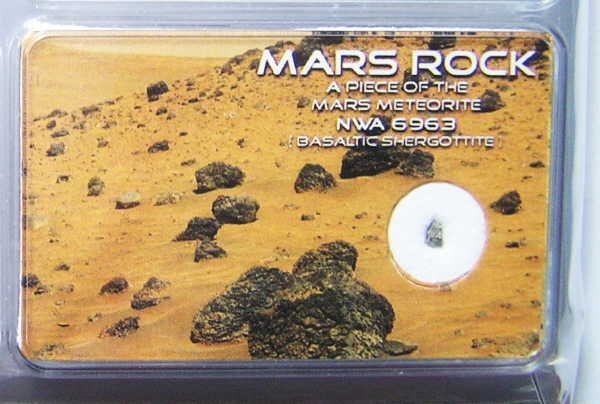 It may not be a massive piece of Mars rock,but I can guarantee it is genuine. The supplier of these has told me he has sold over 20,000 of these boxes around the Globe. They are skilfully made by one of the World's most respected dealers of Planetary meteorites. A lot of time and skill goes into cutting, weighing and mounting these boxes. The box you will receive may not have the exact same picture on the cover. There is a variety of different images which can be seen in the second image. Unless you specifically request an image and I have it in stock I will pick a box at random. The weight of the meteorite is on the reverse of the box along with a signed certificate of authenticity. The weights vary between 7 and 16 milligrams. The box itself measures 5.5 cm x 3.5cm and 1.9cm thick -and the Martian meteorite samples are all roughly 2mm across. Bought from one of the the most respected Planetary meteorite dealers in the World,there is NO better pedigree. I know a fellow meteorite dealer who has given many of these boxes to astronauts he meets at Space memorabilia events. If you've never bought a meteorite before - this could be a lovely little item to start your collection with. Guaranteed genuine for life . You will also receive an exclusive free gift - an illustrated A4 meteorite information sheet.